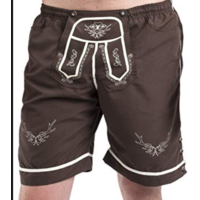 Plattler "Beda" Lederhosen are truly one of a kind and you can go with the Braces and Belt Combo!! 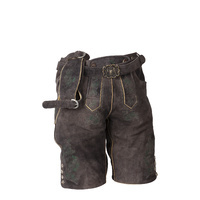 Go to the Oktoberfest on 2 different days and make your outfit look different, one day with braces and one day with the belt only! Elegant in colour with off white marbel effect and traditional "Eichel" acorn stitching. 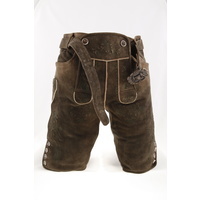 Lederhosen are a natural product and can therefore have very individual variations in colour and character. 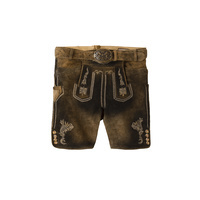 Each Lederhosen thus becomes a one of a kind. 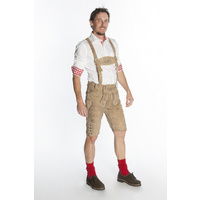 Illustrated with our shirt "Karle" with the very traditional standing colour and small red/white checkered matched with our modern red socks.